If you’re a militiaman rolling in hostile terrain, your best vehicle choice is the Toyota pickup. A minuscule clue in the latest issue of The New Yorker suggests that all that is about to change. 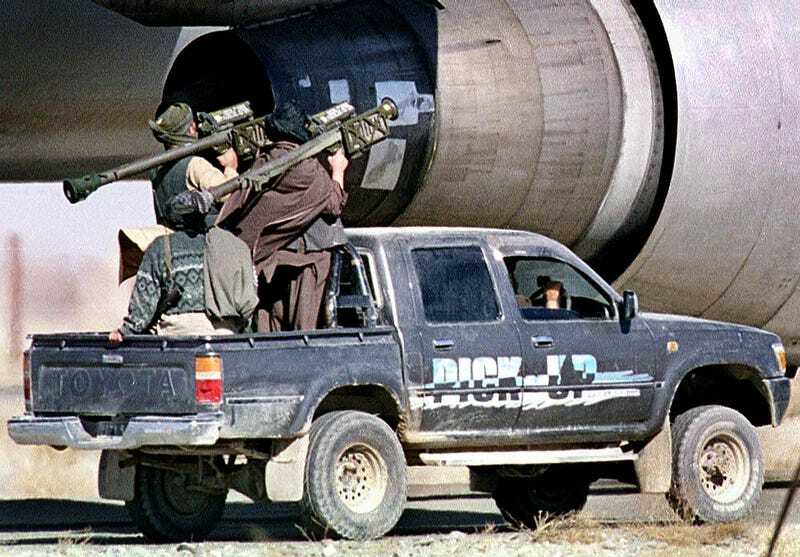 Like the AK-47 assault rifle and the RPG–7 bazooka, the Toyota pickup truck has become an icon of irregular armies worldwide. When mounted with an anti-aircraft cannon or a rocket laucher on its bed, it is called a technical and technicals have helped militas wage and win war against armies equipped with mechanized divisions. There was even a conflict in 1987 called the Toyota War, in which Chad’s Toyota-equipped troops defeated Muammar al-Gaddafi’s Libyan army. The practice is not local to Africa. In Afghanistan, it was an influx of Toyota pickups from Pakistan’s ISI spy agency which transformed the Taliban from a Kandahar militia to a force which took over most of Afghanistan with remarkable speed, defeating established mujahideen commanders with decades of experience. It’s not a Toyota. It’s a quad cab Dodge—a Dakota to my untrained eye, but it could be a Ram as well. This might be an inconsequential detail if the magazine in question was not The New Yorker, famous for their fact checking team. And the truck is definitely not some sort of generic placeholder pickup: it has a Dodge grille. Cooperation between American companies and the Taliban would not be without historical precedent. Back in 1995 before they conquered Kabul and became host to Al-Qaeda, Unocal executive Marty Miller was involved in negotiations with the Taliban leadership for a natural gas pipeline which was to run from Turkmenistan to Pakistan, straight through Taliban territory. While the deal eventually fell through, Miller visited Kandahar several times and at one point even had Taliban leaders flown to Houston for Christmas, of all holidays. Perhaps Toyota, with its humbling losses and its exit from Formula One, has gone over the hill—while Chrysler has found itself a particularly lucrative market for trucks, where demand for new vehicles is guaranteed not by rebates but by American firepower. And nobody likes to stick with a loser. Least of all the Taliban.